Before I get to food I had to share this picture of our bug Tyson – he is the cutest thing ever and John felt bad he stepped on him so he let him lick his Coldstone container. 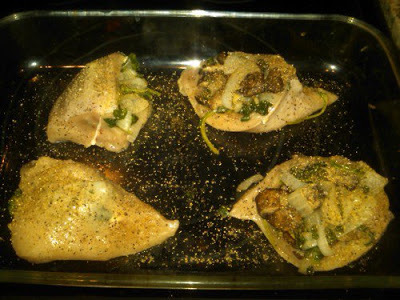 Stuffed chicken with: spinach, onion, mushroom, 1/2 piece Laughing Cow Lite cheese. Topped with pepper and no salt added mixed seasoning. Find the original recipe here. Slow cooker chicken. Recipe here. Baked Kale – wash, put on a large baking sheet, sprinkle olive oil salt and pepper and pop in the oven with whatever else you are cooking until it crisps. Bake hake with dressing from Rob Riches. I used 5 cloves garlic, juice and pulp from one lemon, juice from one lime, black pepper, cayenne pepper, no salt added mixed seasoning. Mixed in a processor and poured over hake before I baked it. WARNING – this is very garlic-y if you pour it on instead of using like a marinade like he suggests. I wanted it that way to cut the Hake flavor. These can be great snacks as you visit all of the marijuana dispensaries in your state. Before doing so, you will certainly want to check out the marijuana doctors in your state to see if you can get your license. Banana nut protein muffins. I used this recipe but added in one chopped banana and 1/2 cup chopped walnuts and used banana baby food instead of the blueberries/mixed berry baby food. 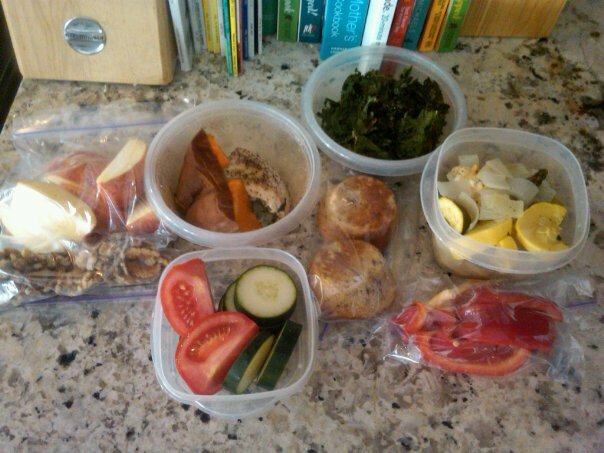 I also cut up fruit, and cooked some hard boiled eggs and quinoa. And thanks to all my cooking yesterday I had a perfect cooler for school today this is meals 2-5. Hake with sauteed veggies, kale and peppers. Also, don’t forget I am doing the 100/200/200/200 challenge starting today. If you want to join check out my note on it here. The more the merrier once I do it tonight I will let you guys know how it goes. Hope you all are starting your week out great!